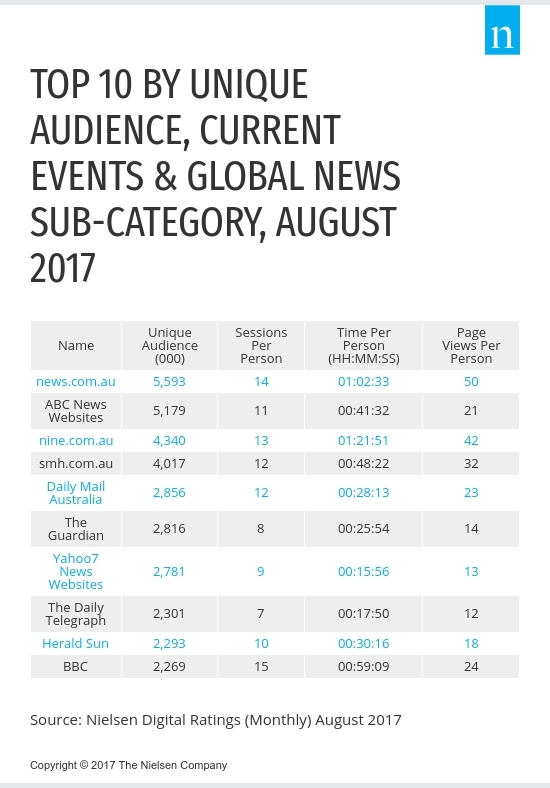 Latest data released today by Nielsen revealed News.com.au retained the top position in Nielsen’s digital rankings with a unique audience of 5.6 million, despite a decrease of five per cent compared to the previous month. With no month-on-month change to the ranking for the top seven news entities, News.com.au was followed by ABC News Websites (5.2 million, up 11 per cent), nine.com.au (4.3 million, down four per cent), smh.com.au (4. million, -down four per cent), Daily Mail (2.9 million, down seven per cent), The Guardian (2.8 million, no change) and Yahoo7 News Websites (2.8 million, up four per cent). The Daily Telegraph (2.3 million, up one per cent) jumped from ninth to eighth place, followed by Herald Sun (2.3 million, up two per cent) who jumped from tenth to ninth and BBC (2.3 million, down three per cent) who dropped from eighth to tenth, when compared with the previous month.